Two people have been on my mind these past few days — Gordon Chance and Bessie Clark. They’ve both passed away but help keep the fire going in my heart. Gordon was Dave’s dad, who we lost last May. 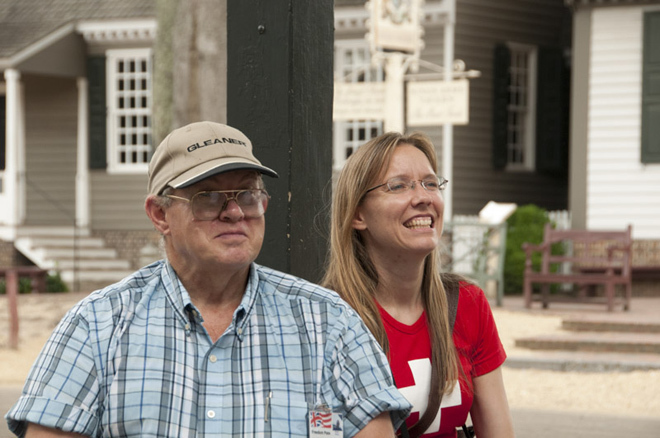 He and Christina loved to visit Williamsburg, so I’ve included a photo of the two of us enjoying a sunny day in that colonial town during 2008. Gordon was skilled with his hands. He was the knowledgeable and hard-working father of seven kids and grandfather of five. I assure you: he is sorely missed. Gordon’s passing was completely unexpected. He died of a heart attack at age 64. We had no opportunity to wrap things up or to say good-bye. That is completely different from the case with the other person on my mind — our former next-door neighbor — Bessie Clark. Ms. Bessie lived on the other side of us from Thom and Beth White. She passed away about five years ago, at the age of 88. 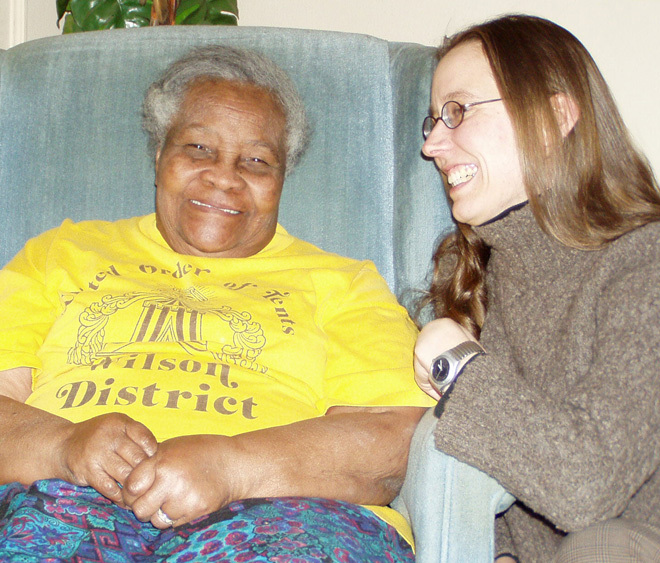 For about two years, in around 2005 – 2006, I visited Bessie in her home every evening. Her kids appointed me to this job because they live far away (Maryland, DC, and California) and because Bessie wanted to stay in her own home but needed someone close by to keep an eye. My visits with Ms. Bessie generally lasted 20-50 minutes. I enjoyed them because she told such fascinating stories. I learned about what it was like for a colored girl (Ms. Bessie’s preferred term) growing up in the American south in the aftermath of slavery. Bessie was born in North Carolina. Remarkably for that day and time, her mother owned her own house and farm. Her mother sent both of her daughters to college — although Bessie stubbornly refused. After a week on campus, she boarded a bus back home. Bessie had no interest in studying more, even though she’d garnered A’s in school; what she came to love most in life was being a mom. In the period I visited, Bessie was going though a very important phase of life. She was reminiscing and reviewing all that had happened. She was coming to terms with pent up frustrations and left over worries. She held nothing back. She told of days working retail and of dealing with a difficult husband who she (somehow) managed to love. During my own life, I have spent a lot of time with older folks. Because I’d heard stories repeated over and over, I assumed I’d have the chance to hear her stories again. I fully intended to ask Ms. Bessie if I could make notes when repetition began. But I heard her life tales only once. My “second chance” never came. When Ms. Bessie had resolved everything to her satisfaction, her story telling stopped. She wanted just to sit and watch TV. When she started watching static, I had to say something. I called her kids to intervene. It turned out that Ms. Bessie had developed a brain tumor. She had to be hospitalized, and she could no longer live on her own. She was unwilling to live that way and, with piece of mind and conviction that she was ready, she determined not to tell anyone when she contracted a bladder infection. I wasn’t too surprised. She wins my superlative for “most stubborn.” She’d threaten as much in years prior. She just didn’t want to live away from her home. A Christmas card from Sam (Bessie’s son) and Barbara Clark. Bessie’s children asked me to speak at her funeral. As an outsider to her community, I thought I’d feel out-of-place. But the congregation, which filled the sanctuary, welcomed me with open arms. The thing that struck me most about the day was how incredibly appreciative the entire congregation was of teachers. They mentioned and praised teachers and the role of education throughout the funeral and the meal that followed it. Not only did I feel welcome, I also felt special and appreciated. I was able to share Bessie’s sentiments about the importance of various people who were assembled there to celebrate her life. In my experience, small things can spark powerful memories. What brought these memories of Bessie rushing forth was a text that arrived from Dave in early December. Bessie’s son and daughter-in-law had sent us a Christmas card. The envelope itself was endearing. They way they addressed it — to Dr. and Mr. David Chance — reflects many of their values. To them, education and formality are important. My life is better for knowing them and for having spent those years learning from Ms. Bessie. So today, I smile to the Heavens, thankful to have known these two fabulous people. And thankful for the legacy they left behind for their families, the world, and me. ← Previous Post What to See in Dublin? Such sweet thoughts. My father, who passed away in 1995, didn’t share stores that way. My mother’s were always a little different from telling to telling. So it was hard to know where the truth was. When dementia finally robbed her of any but the scantest of memories of her family and hard early life–and even those are gone now–I knew I’d have to fill in those blanks from my cousins whose parents, my mother’s siblings, had been a bit more reliable. Sorry to say that my memory only holds a fraction of Bessie’s stories today. What I have is like an impressionistic painting of strong, bold strokes. We are very sad to hear about the sudden death of your father-in-law (David’s father). As we have walked this pathwaay in life earlier, know that through YOU – David and Shannon, all that he touched with his presence and relation, HE and HIS legacy will always be with YOU! The blog on David’s father and my mom was quite touching and endearingly alive with an incredible re-birth of his/her presence and persona in every word you have written. For this we thank you now and always for being more than friends, but more like Family. The blog is great! When I have some time I will gather my thoughts and send you a comment or two.